WordPress Vs Drupal | Which CMS to Choose for your Website? Finding the best Content Management System (CMS) for your business website is no more difficult and time consuming these days. There are options out there and no doubt that you are eligible for doing your research and selecting the CMS that suits your requirements. You would love to choose the CMS that will provide you multiple benefits including ease of use, increased functionality and no complexity. At the start, people found it difficult to choose between WordPress and Drupal along with other content management systems. Most of the social sector agencies always preferred Drupal over WordPress. However, for every end-user, WordPress was the fine choice for them. Drupal could have stayed in the competition with WordPress but, Drupal moved towards an excellent enterprise solution. They increased the complexity of codebase, and that is the reason why the end user starts avoiding Drupal. Even, most of the organisations moved away from Drupal and started using WordPress, which in comparison, was providing a lot more to the end users. WordPress focused on ease of use, and it grew as a community where every single person can contribute by creating WordPress’ extensions to increase the functionalities. Let’s have a look at the quick summary of how WordPress capture the market share as a CMS and left all other CMSs behind. We all know that the WordPress has more market share as compared to all other CMSs out there. WordPress captured 60% of the growth in the market after 2011. WordPress is dominating Drupal in almost every category. WordPress dominates the entire internet by 26x as compared to the Drupal. WordPress also has more powerful e-commerce websites and dominates all the e-commerce platforms including Shopify. Moreover, the Google search trends show that there has been a decrease in the interest of Drupal by 70%. Well, these are just the stats. To understand what happened and how WordPress got the increased market share, you will have to compare both content management systems. 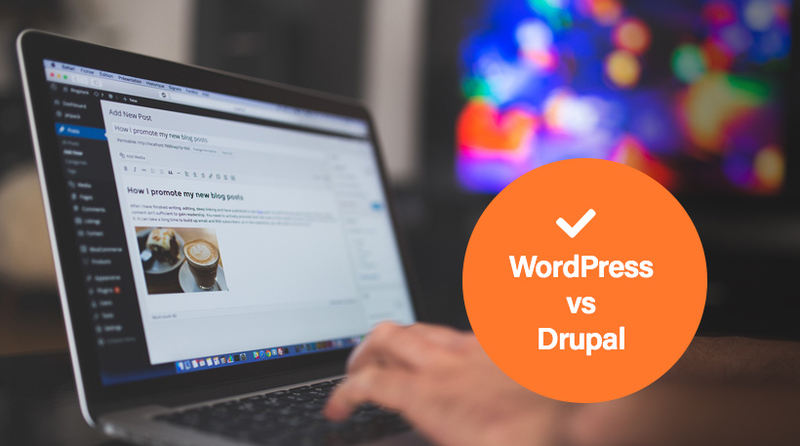 Here is a detailed comparison of WordPress and Drupal and how WordPress dominates all other content management systems out there. Whenever you are building a website, and you are looking for a CMS, you will have to select the CMS that gives you ease of use. You do not want something as complex as Drupal. Drupal is a great platform perhaps not for the end users. WordPress has provided all those things that the end users can dream of. If you have never heard of WordPress and you are about to build a website using WordPress, then you can learn all the basics and get started with your site by checking a single guide about WordPress and how it works. One of the significant advantages of WordPress is its fantastic community. The community is so big that you can get answers to every single question you have. On the other hand, when you are about to use Drupal for the first time, you will face many difficulties as it is a complex CMS. There is no doubt that the Drupal also has a community, but it is smaller as compared to the WordPress. When there are updates, WordPress will give you the updates after every 3 or 4 months, and you do not even have to worry about the updates. On the other hands, the Drupal’s updates do not include the code. You will require a development knowledge to handle such a thing. WordPress also gives you an incredible mobile site that helps you edit and post articles even if you are not using a laptop or a PC. WordPress gives you unlimited options to customise your website. The best way to use themes and plugins. You will find plugins for almost everything that you are looking for. All you have to do is to search for the plugin in their plugin repository. Due to the large community of WordPress, you will also be able to find unlimited premium themes with increased functionalities and custom page builders. It is how WordPress becomes an excellent e-commerce solution. However, the Drupal offers these increased functionalities and flexibilities on page types without the need for plugins. Moreover, most of the good options are not for free. However, if you are building a simple website using WordPress, you can find plenty of things for free. You should also know that there are limited themes available for Drupal and if you need a custom website on Drupal, you will have to hire a designer and developer to complete the work. As we have already discussed that the WordPress has a large community, you will find many people out there submitting multiple solutions for WordPress. Even if you are a new user and you have a question, you can just look for answers on the search engines. If you need some custom work, you will be able to get the best advice from the people using WordPress. Moreover, due to the huge WordPress community, you will be able to find premium themes and plugins that can provide you almost every solution for your website. As compared to the WordPress, Drupal community is not that big. There is no doubt that there is a community of Drupal and it is not a small one but, just not big enough as compared to the WordPress. Moreover, if you need to do some customisation, you will have to take help from the experienced designers and Drupal developer.